«From the west country sail west but keep far enough north of the Shetlands so that these islands are barely visible in clear weather. One should stay far enough south of the Faeroes so that their steep and high mountains are just halfway up over the horizon. In addition one should stay far enough south of Iceland so that you can’t see land but just the coast-bound birds. When you reached the east coast of Greenland you should keep a lookout for landmarks and follow the current west around Cape Farvel to the villages on the south-west point». Bergen, the city of seven mountains, is the largest city on the west coast of Norway with a population of 280 000. Bergen was founded in 1070 by king Olav Kyrre. Then the name was Bjørgvin, «the green meadow among the mountains» and it served as Norway’s capital in the 13th century. 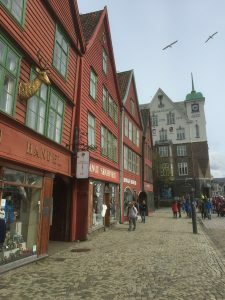 Fish trading in Bergen may have started as early as the 1020s and from the end of the 13th century Bergen became a bureau city of the Hanseatic League. Bergen is today an international centre for aquaculture, fishery, shipping, offshore petroleum industry and subsea technology, and a national centre for higher education. Bergen Port is Norway’s busiest in both freight and passengers. Bergen is well known for having the mildest winter climate, though with a lot of precipitation, of all cities in the Nordic countries. The Atlantic Stream keeps the sea relatively warm, considering the latitude, and the mountains protect the city from cold winds from the north, north-east and east. The name of Shetland is derived from the Old Norse word, Hjaltland. 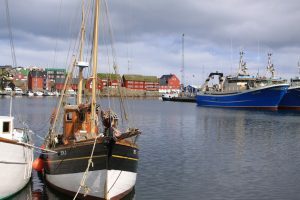 The closest town to Lerwick, the capital of Shetland is Bergen, Norway. 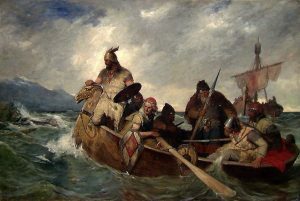 The expanding population of Scandinavia led to a shortage of available resources and arable land there and led to a period of Viking expansion, the Norse gradually shifting their attention from plundering to invasion. Shetland was colonised during the late 8th and 9th centuries. Modern Shetlanders have almost identical proportions of Scandinavian matrilineal and patrilineal genetic ancestry, suggesting that the islands were settled by both men and women in equal measure. In the 14th century, Orkney and Shetland remained a Norwegian province. Jon Haraldsson, who was murdered in Thurso in 1231, was the last of an unbroken line of Norse jarls. On the death of Haakon VI in 1380, Norway formed a political union with Denmark. In 1469, Shetland was pledged by Christian I, in his capacity as King of Norway, as security against the payment of the dowry of his daughter Margaret, betrothed to James III of Scotland. As the money was never paid, the connection with the crown of Scotland has become perpetual. The Orkneyinga Saga is clear in its interpretation of the founding of the Orkney earldom. It explains that the Norwegian king, Harald Harfagri (Fairhair) sailed westwards to deal with Vikings who, after raiding Norway throughout the summer, were making Orkney their base. On this voyage, Earl Rognvald of Møre, received the Earldom of Orkney from King Harald as compensation for the loss of his son, Ivar. Not interested in the Orkney earldom, Rognvald passed it to his brother, Sigurd. Faroe Islands is an island country consisting of an archipelago of small islands between the Norwegian Sea and the North Atlantic Ocean, approximately halfway between Norway and Iceland. It consists of 18 major islands and covers an area of 1,400 square kilometers and with population of nearly 50 000. The islands are an autonomous country within the Kingdom of Denmark. Between 1035 and 1814, the Faroe Islands were part of the Kingdom of Norway. The 1814 Treaty of Kiel granted Denmark control over the islands, along with two other Norwegian regions: Greenland and Iceland. The Saga of Ólafr Tryggvason and Flateyjarbók claim that a man named Grímur Kamban was the first man to discover the Faroe Islands. The Saga of Óláfr Tryggvason indicates that Kamban was residing in the Faroes long before the rule of Harald Hårfagre, and that other Norse were driven to the Faroe Islands due to his chaotic rule. This mass migration to the Faroe Islands shows a prior knowledge of the location of Viking settlements. While Kamban is recognized as the first Viking settler of the Faroe Islands (even though his surname is of Gaelic origin), he actually re-settled the island. 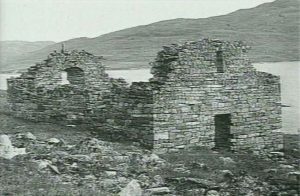 Writings from the Papar, an order of Irish monks, indicate their settling of the Faroes long before Vikings ever set foot there, only leaving due to ongoing Viking raids. According to Landnámabók, the settlement of Iceland began in the year 874 AD when the Norwegian chieftain Ingólfr Arnarson became the first permanent settler on the island. In the following centuries, mainly Norwegians and to a smaller extent other Scandinavians settled Iceland, bringing with them thralls of Gaelic origin. From 1262 to 1814, Iceland was ruled by Norway and afterwards by Denmark. Iceland became independent in 1918 and a republic in 1944. Until the 20th century, the country relied largely on fishing and agriculture. Iceland is closer to continental Europe than to mainland North America; thus, the island is generally included in Europe for historical, political, cultural, and practical reasons. Geologically the island includes parts of both continental plates. The closest body of land is Greenland (290 km). The closest bodies of land in Europe are the Faroe Islands (420 km). The mainland of Norway is about 970 km away. Greenland is a history of life under extreme arctic conditions the ice cap covers about 80 percent of the island restricting human activity largely to the coasts.There is no evidence that Greenland was known to Europeans until the 10th century, when Icelandic Vikings settled on its southwestern coast. The early Norse settlements along the southwestern coast disappeared sometimes during the little ice age. During this time, Denmark-Norway, apparently believing the Norse settlements had survived and continued to claim sovereignty over the island. In 1721 Denmark-Norway sent a missionary expedition to Greenland with the stated aim of reinstating Christianity among descendants of the Norse Greenlanders. When the missionaries found no descendants of the Norse Greenlanders, they baptized the Inuit Greenlanders they found living there instead. Denmark-Norway then developed trading colonies along the coast and imposed a trade monopoly and other colonial privileges on the area. Although Greenland is still a part of the Kingdom of Denmark, it has enjoyed home rule since 1979. In 1985, the island became the only territory to leave the European Union, which it had joined as a part of Denmark in 1973; the Faroes had never joined. Leiv Eiriksson was probably born in Iceland ca. 973 as the son of the Norwegian Eirik the Red. His father Eric was a pugnacious man and was made an outlaw in Iceland and setteled in Brattalid on Greenland. Eirik was even the son of a Norwegian outlaw, Thorvald Åsvaldsson. 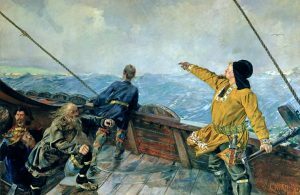 Bjarne Herjulvsson was an Icelandic trader and discovers the 900s which is the first known European who discovered the American continent when he went off course and got to see it in 986. Bjarne went however not on land. There are two sources of what we know about Leiv Eiriksson, Eirik the Red’s saga and the Greenlanders saga that both tells about the same events, but with some minor differences. The former saga tells that he went off course and came to Vinland. The latter saga tells that Leif set sail from Brattalid about 1000 to follow Bjarni Herjólfsson route with a crew of 35 man, but in reverse order. The areas that Leif Eriksson discovered and explored where christened by him Helluland, Markland and finally Vinland. The areas are thought to be Baffin Island, Labrador and Newfoundland respectively. The archaeological excavation at L’Anse aux Meadows was conducted in the 1960s by an international team led by archaeologist Anne Stine Ingstad under the direction of Parks Canada in the 1970s. The Norse settlement at L’Anse aux Meadows has been dated to approximately 1,000 years ago, (carbon dating estimate 990–1050 CE) The remains of eight buildings were located. They are believed to have been constructed of sod placed over a wooden frame. Other things found at the site consisted of common everyday Norse items, including a stone oil lamp, a whetstone, a bronze fastening pin, a bone knitting needle and part of a spindle. The presence of the spindle and needle suggests that women as well as men inhabited the settlement. On 13 August 1905 she left Gjøa Haven and set her course toward the unknown west. Ice, fog and shoals endangered the progress and often there was barely a foot of water under the keel. 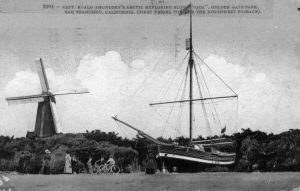 Gjøa advanced, and on 17 August she dropped anchor at Cape Colbourne, the easternmost point that had been reached in these waters by any ship coming from the Bering Strait. The Northwest Passage was completed. The 26 August, the first ship coming from the west was sighted, the whaler Charles Hansson of San Francisco was the first to congratulate Amundsen on his success. Amundsen hoped to reach the Bering Strait and civilization that year. On September 2 the progress was stopped by ice at King Point, near Herschel Island, and within a week it was evident that another winter had to be spent in the Arctic. This time the Gjøa had much company, no fewer than 12 ships had been caught at Herschel Island. Gjøa reached Nome on the 31st of August 1906, where she was given a reception worthy of the adventurous and boisterous gold seekers who at that time were making Nome famous. From there, the trip back to Norway was a triumphant journey for Amundsen and his crew. The Gjøa was however not returned to Norway. She was presented to the city of San Francisco and was in 1909 placed in Golden Gate Park. She deteriorated badly, but was restored in 1948. However, decay began again. Poor materials, vandalism and lack of maintenance led to efforts to get Gjøa home to Norway. Gjøa on her way to Bygdøy, Oslo Photo: Norsk Maritimt Museum. 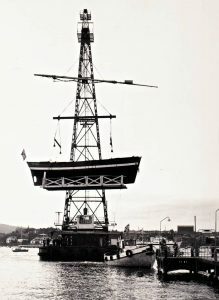 further by a floating crane and placed on the deck of the M/S Star Billabong. Gjøa arrived Oslo 2 June 1972. Floating crane to Oslo Port Authority placed the Gjøa on the concrete foundation riverside outside the Fram Museum, and Gjøa was formally handed over to the Norwegian Maritime Museum. She has today company of Fram and appear as a proud memory of Norway’s golden days in the exploration of the Arctic and Antarctic. Fram is said to have sailed farther north (85°57’N) and farther south (78°41’S) than any other wooden ship. Fram is preserved at the Fram Museum in Oslo, Norway. Vancouver is the final destination for this voyage. Vancouver will also be the place for contemplation. What will be the fate of S/Y Romar. Should I sail her back to Norway and what route should possibly be used, or should she sold? In any case, she will stay over the winter in Vancouver.